Seems on leather bags and briefcases, torn marquees, tents and sails – just everything that has a seem – if will be nearly impossible to repair things like that with the ordinary needle you have at home. Thick thread with the small needle and not enough power for sewing the stable material. Like this you really get in trouble and a lot of fingers did not survive this procedure without injury. 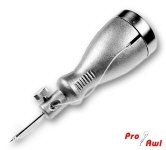 The professional pro-awl is easy to handle and is able to sew even difficult seems in heavy materials. The needles, a bobbin with sewing thread and a shuttle are stored inside the hollow handle, completely made of metal. The multilingual operation instructions will help you doing the firs steps and after a little bit of practicing you will be able to sew a 30 cm seem in less than 10 minutes. Further information at www.pro-awl.com.